A roof is an essential part of a building that needs to be maintained well, so it lasts longer. Since commercial flat roof repair services, as well as roof replacement, require time and substantial investment, it helps to think carefully and consider essential aspects when using such services. This will also help protect other elements of the building such as the ceiling and adjacent walls. However, it is critical to know when to repair or replace a roof. Fortunately, there are a few warning signs that indicate when you need to replace or repair your roof. How long a roof will last mostly depends on the type and quality of materials used. However, there are many outside factors that can help you determine whether you need to replace your flat roof or repair it. 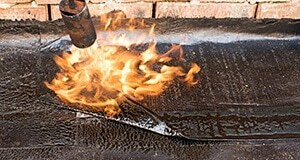 A flat roof should be installed using the right techniques and materials, so it is watertight and does not get damaged easily or allow water leakages. It should be slightly sloped to prevent waterlogging. Otherwise, it may severely weaken the roof and other components of the building. Branches that are constantly in contact with the roof or fallen tree limbs can damage the shingles and negatively impact the integrity of your roof. Thus, you may require flat roof repair services frequently. The sun’s UV rays tend to cause damage to roof shingles over time. Thus, continuous exposure to direct sunlight may have a negative impact on its longevity. The extreme weather conditions in Canada including storms, rainfall, fierce winds, and blizzards can damage your roof, leading to the requirement of roof replacement services. The fluctuation in temperature can also have a similar result as roof shingles tend to contract and expand even over short time periods. Inspect your building from inside for any leaks or stains and the growth of mildew. These are hints that you may need to call professionals for flat roof repairs. If the problem is severe, you may also need to replace the roof. Examine your building on the outside for partially lifted or missing shingles as well as other types of climate-related damages. When to Replace or Repairs Commercial Flat Roofs? At Integrity Roofers, we know the significance of regular roof inspection and maintenance to ensure the longevity of flat roofing systems. We have experts who can provide adequate assistance according to your needs and come up with suitable solutions for all your problems. For more information about our roof replacement services or commercial flat roof repairs in North York, talk to our specialists by calling 647-953-9365. You could get a free roofing estimate by filling out our online form.